Fresh ingredients are one of the keys to great beer. More than once I’ve been burned by old or improperly stored brewing ingredients resulting in flat, cardboard tasting beer. So this week I’m going to share some of the lessons I’ve learned about keeping ingredients fresh. Fresh extract is really important for beginning home brewers, but light, heat and oxygen are enemies of your extract. Heat will, over time, make the malt darker and also break down the maltose. Light also breaks down malt, and can create skunk like flavors. 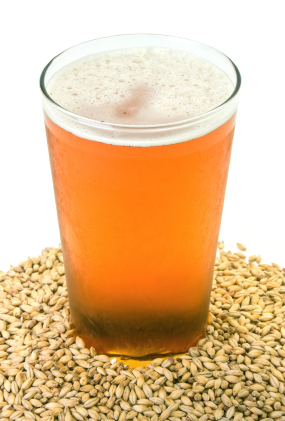 Oxygen will oxidize your malt, leaving you with cardboard or stale beer flavors. This is true for both liquid and dry extract. First, you are always better off purchasing fresh extract than extract that was canned and left on a shelf for several years. Second, your malt should be stored in an oxygen barrier container if possible, and finally extract belongs in the refrigerator, not in your garage or basement. Extract that is sealed properly and refrigerated can last up to a year, though I recommend using it within 6 months if possible. Whole malted grains can safely be stored for a year or more, so purchasing in bulk is fine. However, you still want to avoid excessive heat and moisture. Heat can degrade the grains, and moisture can result in mold, bugs or infection (souring). Store your whole grains in a cool dry place, ideally away from sunlight. You can use the refrigerator if you have space, but its not necessary for whole grains. Crushed grains present a larger problem. Crushed grains are prone to oxidation, and more susceptible to heat, light and moisture than whole grain malt. I recommend keeping crushed grains in sealed containers and placing them in the refrigerator until you are ready to use them. Stored in this way they can last a few months, however I personally try to use my crushed grains within a few weeks of milling whenever possible. The best solution is to purchase bulk grains in whole form, store them properly, and purchase a good malt mill such as the Barley Crusher (which we offfer) to mill them as needed. Hops are also susceptible to moisture, light, oxygen and heat degradation. Both the alpha bittering acids and the aroma oils degrade over time. Each variety has different storage characteristics – measured by the Hop Storage Index (HSI) – which is the percent of alpha acids lost in six months if you store your hops at 68 F (20 C). You can extend this time by storing it colder – ideally in your freezer. However the HSI does not tell the whole story, as it only measures alpha acid loss. Oxygen also degrades hops, so to protect your hops you need to put them in an oxygen barrier container such as the vacuum sealed foil packets than many brands now are distributed in. Ziplock bags are not a good option – they don’t really seal out all of the oxygen. Also you want to keep them from light. So to make your hops last as long as possible keep them in sealed foil pouches, and store them in your freezer. Dry yeast packets are the easiest to store. Just keep them in a cool, dry place – or perhaps the refrigerator if you want them to last a bit longer. However, even a shelf stored packet can last for more than a year, as they only lose about 1-2% of their viable yeast cells per month. Dry yeast is also nice to work with as you don’t usually need a starter – and can just hydrate the yeast 20 minutes before pitching in a little warm water. Liquid yeast vials or smack packs are an entirely different story. They are more prone to heat and light degradation and also lose significantly more cells as they age. Liquid yeast really must be kept refrigerated – you can’t store it on the shelf. Even then, liquid yeast loses about 20% of its viable yeast cells per month, which means it has a useful shelf life of about six months. Unless the package is brand new, most beers will benefit from a yeast starter when working with liquid yeast – a good starter will ensure you are pitching the ideal number of cells for your batch. Thanks for joining me on the BeerSmith Home Brewing Blog. Be sure to sign up for my newsletter or my podcast (also on itunes…and radio station) for more great tips on homebrewing. I’ve stored my uncrushed grains for 3-4 years, in an airtight container — I bought two Vittles Vaults that each hold a 55# sack of grain for my Maris Otter and Pils malts, which have a gamma seal lid for an airtight seal. I also purchased several gamma seal lids for regular 5 gal. buckets, in which I store my speciality grains (each in their own Ziplock bag with the air sucked out). I have always contended that malt stored in silos at breweries can be exposed to days of temperatures of well over 100 degrees. Farm grain in silos can get over 110 and everything is just fine. Humidity is altogether another story. High humidity will ruin grain quickly . I’ve been keeping pils malt (grain) in an open door garage this summer because I was to lazy to carry it to the basemen, some 15 meters away. 🙂 So it’s been exposed to sunlight, sun heat, some moisture also. The grain is in the 50kg double bag. Is it ok to use it for brewing?? Sorry about the spelling, english is not my first language. Cheers!! I’m going to get my hands on a lot of malt quality barley from a friend and try my hand at malting it myself. I don’t know whether to malt it all at once or in smaller batches as needed. My question is this: Will un-malted barley last even longer than malted if stored properly? Next post: All BeerSmith Podcast Episodes on iTunes Now!